Calvin L. Smith: Review of "The Jews, Modern Israel and the New Supercessionism"
Review of "The Jews, Modern Israel and the New Supercessionism"
The following review of The Jews, Modern Israel and the New Supercessionism: Resources for Christians appeared in the Summer 2010 issue of Pneuma Review (13.3). It's a rather nice review of my book and I asked for permission to reproduce it here, which was graciously given. Further details of the journal can be found here. 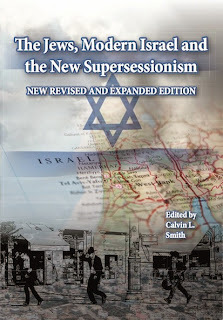 Calvin L. Smith, ed., The Jews, Modern Israel and the New Supercessionism: Resources for Christians (King’s Divinity Press), 164 pages, ISBN 9780956200600. Finally—a single book that treats Replacement Theology, Israel, and the Jewish people with respect, reason, and biblical integrity. Over many years working with Christians I have encountered too many who will ardently profess that they are not anti-Semitic, yet continue to hold to the premise that the universal Church supplants biblical Israel. Consider for a moment how that must make the average Jewish man or woman feel to be told that God is done with them, that their role in God’s plan has ceased, that the blessings in the Bible proclaimed for Israel have been transferred to the church, and you begin to realize how thoroughly anti-Semitic this theology is. That goal was achieved. In chapters such as “Who is the ‘Israel’ of Romans 11:26?,” “Apostolic Jewish-Christian Hermeneutics,” and “Israel and the Purposes of God”—to name a few—readers are given a well-rounded background in how Protestants derived their supersessionistic doctrines. These doctrines are then graciously dissected, discussed, and debunked. There is a great deal of common sense as well. In Smith’s contributions in chapters two and seven: obvious, and not-so-obvious facts about the nation of Israel are brought to light, giving the reader new concepts to consider. He also handles “multiple fulfillments of prophecy” nicely, helping readers understand that prophecy does not have to be locked into an either this/or that dimension. Jacob Prasch’s chapter on “Apostolic Jewish-Christian Hermeneutics and Supercessionism” is one of the finest arguments in favor of Jewish roots studies I have ever read. Prasch does an excellent job helping the reader grasp the depths of Scripture yet to be plumed by “gentilized” Christianity: to grasp and yearn for more. Stephen Vantassel’s chapter, “A Calvinist Considers Israel’s Right to the Land” certainly captured my attention, by virtue of the title’s cognitive dissonance alone. No stranger to The Pneuma Review, Vantassel’s biblical approach to the hotbed of modern Israeli politics should convict every reader, regardless of whether they have a positive or negative view of the Knesset. As he writes, “we must be sure that our tone is moderated and our statements endeavor to assume the best of those of which we disagree.” (p. 82). On the whole, the book’s approach to the Jews and modern Israel is well balanced and informed. A must read for anyone navigating the labyrinth of the Israeli national, religious, and ethnic landscape. Author Howard Taylor’s chapter on “Israel and the Purposes of God,” is punctuated with a very Jewish form of Gemara (literally “to study” in the Aramaic), a pattern well used by the Messiah and the apostle Paul: “if this is true, then how much more so this?” (ref: Matthew 7:11, 10:25, 12:12, Romans 5:9, 2 Corinthians 3:9, and others). For instance, “If one believes that Christ fulfills Israel’s destiny from Abraham to the end of time, then one will see Israel’s continuing history as ‘in Christ’…” (p. 95). At times Taylor’s if-this-then-that approach can feel confrontational, but once you understand the pattern, the pill goes down easier. Paul Wilkinson’s “Jealous for Zion: Evangelicals, Zionism and the Restoration of Israel,” clearly demonstrates how Christian involvement in the 19th Century began paving the road toward a restored Jewish nation. In 21 short pages, readers are exposed to the history behind Israel’s rebirth as a nation, as well as the hope and prayer for her rebirth into the death and resurrection of her Messiah. As the subtitle promises, this book contains Resources for Christians in convenient, bite-sized bits that both challenge and encourage. It presents materials for both academicians and laity alike in a well thought out format. I heartily endorse The Jews, Modern Israel and the New Supercessionism and hope that Calvin Smith will compile even more titles such as this. The body of Christ needs them. Calvin - In this review Williams calls your book 'respectful' (which it is is the main), but then launches an unpleasant attack on those who reject Christian Zionism. He writes "I have encountered too many who will ardently profess that they are not anti-Semitic, yet continue to hold to the premise that the universal Church supplants biblical Israel." I do find this frustrating that there seems to be a determined misrepresentation or 'blindness' here, even amongst scholars who should know better. Why must some persist in falsely labelling (libelling?) Christians as anti semitic because they are not Zionists? Tom Wright and Stephen Sizer hold that the Church is in unity and continuity with biblical Israel, not supplanted. (it is my position as well and it seeks to identify strongly the Church with her true Jewish - Israelite roots). This determination to divide and rule and misrepresent positions surely lacks integrity. Surely we can have a debate based on accuracy and find middle ground. Hi Andrew. It is presumably para 2 you are referring to. To be honest, I don't read it as a blanket attack on supercessionism, but rather a reference to a militant anti-Israel supercessionism which, in some quarters, has been expressed in a manner which is anti-Semitic. Consider how, twenty years or so ago, Christians who rejected the viewpoint that God retains a plan and purpose for Israel were not labelled anti-Semitic. So something has happened since then, namely, an unnecessarily polarised debate emanating from a new and militant expression of supercessionism whereby millions of Christian Zionists are labelled "deviant heretics". There is onviously going to be some reaction. Besides, it the reviewer's own view, much like that of the Christian brother you cite in your comment who, unfortunately, regards me and millions of Christians who take a different view from himself on Israel as deviant heretics. Seeking to be as respectful and gentle as possible to someone who, though I strongly disagree, is nonetheless a brother in Christ, I just wonder if you have voiced similar concerns about his unnecessarily unhelpful language. After all, you are in touch with him and you have the perfect opportunity to do so. As you know, I think the pejorative and polarised nature of the debate has got out of hand, and this is one of the very issues the recent conference in London highlighted. Further details will be available when a short press release about the conference is released tomorrow. Hi Calvin - there are clearly different views on Christian Zionism and clearly not all should be described as heresy. Perhaps as well it is better to speak about erroneous doctrine and not make it personal or use inflamatory language. But a question, where should the boundary lie between acceptable Christian Zionism and non-acceptable Christian Zionism? Some extreme forms seem to be actively advocating war and the destruction of Israel (apart from the 144,000 lucky few) and Arab nations. Some reject Messianic evangelism to Jews setting aside the grace of God in Christ. These are issues to be raised, but there is perhaps a tendency to form a Zionist block where there is not much apparent internal debate within Christian Zionism. There is perhaps a relcutance to criticise the extreme forms from within the movement - at least that is how it seems to me - a few such as David Pawson though make some useful comments. Am I wrong on this? "Perhaps it is better to speak about erroneous doctrine"
Well, I don't know. How do you feel about me saying your supercessionist beliefs are erroneous, or that you belong to an erroneous element within the Church? Concerning acceptable and non-acceptable CZ, clearly avoiding Jewish evangelism contradicts Scripture. But this is a minority CZ position. Meanwhile, reading oneself into pivotal roles to fulfil biblical prophecy is as anthropocentric as some expressions of postmillennialism. "Am I wrong on this?" (what you say in the last paragraph). I honestly think you are. First, there is a major difference between what popular and academic CZs believe. Also within popular CZ one must differentiate between covenantal CZs and the prophecy-driven element, or the watch-and-pray vs the actualising crowd (see comment above), mild vs militant, and so on. To bunch them all together and call them all heretics is not only unhelpful, it is profoundly dishonest. Have you ever raise this issue of language with him? But going back to where you began, isn't there a variety of views within supercessionism too, from militant to mild, theological vs political, pro-Palestinian and anti-Israeli vs theological/nonpolitical, those who will share platforms with speakers who condone suicide bombings and those who would be horrified to do so? Yet if I called you (despite the fact, I'm sure, you would never share a platform with one who endorses suicide bombings) a heretic, you wouldn't be very happy about it. As I said earlier, something has changed in the last twenty years, notably the tone and language of the debate, owed in large part to the new supercessionism. Calvin - I am sure you can prove me of error on some matters, or else I could claim to be God, in which case I would then be in error, a heretic and a blasphemer ;o) Thankfully perfect theology is not a pre-requisite to becoming or being a Christian and the noetic effect of sin is not totally removed until we see Christ face to face. I think sometimes CZs don't realise the passion to which some Christians approach questions of social justice. For some it is just trendy-politics, for some it is a real passion for people. So some Christians can get very passionate about issues such as Palestinian suffering and rights. Quite clearly some CZs get very passionate about historical Jewish suffering which I wouldn't want to criticise either - although I think both sides of the passion debate need to focus on justice, peace and love for all. I think you need to see the rise of what you call the 'new supercessionism' in light of a growing awareness than real people (including ancient Christian communities) are suffering because of the policies of the State of Israel thaty is supported by some Christians authors - and yes suffering by the hands of Islamists as well which we should speak against, but we should still love muslims as human beings. I think Stephen Sizer does address the question of varieties of views on CZism, although his stronger criticisms are directed at the more extreme forms. I am not sure I would criticse who people meet with if they themselves are seeking to build God's kingdom in that environment - several American Charismatics met with Yasser Arafat. I note you still see my position as supercessionist. I might agree that it is partially supercessionist, but Jesus and the disciples, plus the 120 men in the upper room who formed the core of the church, were real Jews. If Zechariah 13:7-9 applies to the work of Christ, as I believe it does, it shows Judah-Israel divided into a faithful 1/3rd and an unfaithful 2/3rds - it is then only partially supercessionist in terms of people, but I would argue it is not supercessionist in regards to the Abrahamic Covenant fulfilled in Christ. You draw a distinction between popular level beliefs and academic beliefs. I would ask then whether you see a place for an academic such as yourself to write a popular level book to explain what you see as acceptable CZism and what not acceptable? You see, it's this implied assumption (you did it just now in your comment) that somehow all people on our side don't care about Palestinians, that support for Israel means to be anti-Palestinian, while it's only the people on your side who truly care about Palestinians. This is precisely the point Mitch Glaser made in his last paper. It is a fallacy, and frankly it is somewhat offensive. Many of us pray for Palestinians, share the Gospekl with them, have fellowship and work with them. Many everyday Palestinians have had a raw deal, not least through poor leadership and other countries in the region happy to utilise them to detract from their own political failures. Sorry, concerning your last point about whether there is room for an academic to write a popular book from within which highlights extremes of CZ, yes, I think there is a need for that. In fact, I would suggest many CZ people want exactly that. You see, many of them are tired of being tarred with the same brush (I was just with a group of such people in the US a few months ago who made precisely this point). The question is, who will do it? Sorry Calvin, no offense was intended - and I think your own question about land for peace suggests you are aware of the problems for Palestinians. I guess what people are questioning is the belief amongst some CZs that Palestinians may be rightly excluded from their land so that Jews may settle there instead according to some divine plan. In other words, at the core of some CZ positions is the denial of rights for Palestinians because of a belief in the legitimacy of Israeli expansionism. Andrew, I know you didn't intend to cause offence. My point was to point out how too often we are labelled anti-Palestinian because we believe God retains a plan and purpose for Israel. For my own part, I'm quite content pray for Israel then let God work it all out... it is not for me to determine Israel's borders in the grand scheme of things, but rather God's (after all, I believe they remain His people, so you couldn't ask for a greater champion than that). This is actually what I was getting at in my last post: to encourage some CZs to begin thinking how important theologically the current borders matter, or if they are changed by men does this in any way affect God's plans? Actually, while I strongly disagree with Philip on his views that God no longer retains a special plan and calling for the Jewish people (he talks about the onus being on CZs to prove their view on the land, but according to that measure, and especially in light of Romans 9-11 the onus is very much on him to prove supercessionism), I actually take the view - like him - that the issue of ownership of the land is ultimately in God's control, not ours. (Which sort of makes me wonder why he can't take the same view concerning the situation of the Palestinians). Actually, I currently oppose giving up land for peace at the present time, but this is along predominantly political and pragmatic reasons, rather than theological reasons (I do not see Hamas, Hizbollah, Iran or Islamists in general ever making peace with Israel, as the Gaza and Lebanon withdrawals proved - the issue goes to the very core of militant Islam in the region). So I wanted to ask CZs for their views on this issue to allow me to examine if my view is biblically consistent, hence the question in the last post. Unfortunately that debate became bogged down in other issues, which is a pity because, apart from the verse cited by Chris (which I wanted to explore further, it was a good point) I would still like to hear from CZs just how central this issue of land is for them and just exactly we should be on it. Finally, in response to your comments about CZs denying Palestinian rights, I could really throw this right back at you and ask how widespread is the notion of, for example, sharing platforms with suicide bombers? I guess I'm saying you have your own extremists too. So what are you people doing about it? Which reminds me (so sorry to labour the point), you keep on about extremist language by CZs, but have you asked the churchman in question yet about his intemperate language? I'm afraid I'm going to keep asking until I get some sort of answer ;) (sorry).